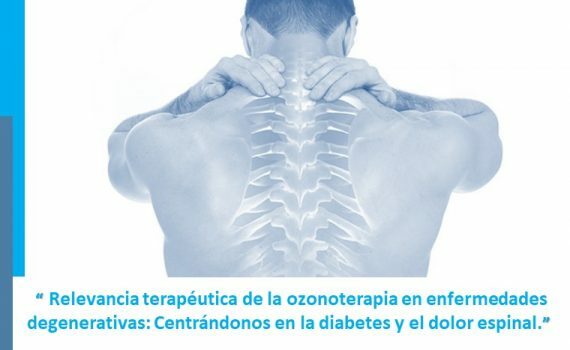 Relevancia terapéutica de la ozonoterapia en enfermedades degenerativas: Centrándonos en la diabetes y el dolor espinal. J Cell Physiol. 2018 Apr;233(4):2705-2714. doi: 10.1002/jcp.26044. Epub 2017 Jul 11. El Dr. Braidy y su equipo, de la Universidad de Nueva Gales del Sur (Sydney, Australia), desde el Centro para el Envejecimiento Cerebral Saludable, han demostrado que la ozonoterapia activa mecanismos moleculares en las células que benefician los sistemas antioxidantes y serían útiles en el tratamiento del dolor, y de la diabetes y sus complicaciones. El paciente diabético suele ser más sensible al dolor, por lo que precisa tratamientos más especializados, generalmente multidisciplinares, en los que el ozono médico (tanto infiltrado como endovenoso) es muy eficaz. En Clinalgia somos pioneros al respecto, y nuestra experiencia es muy positiva, después de años tratando pacientes con dolor crónico y diabetes. Ozone, one of the most important air pollutants, is a triatomic molecule containing three atoms of oxygen that results in an unstable form due to its mesomeric structure. It has been well-known that ozone has potent ability to oxidize organic compounds and can induce respiratory irritation. Although ozone has deleterious effects, many therapeutic effects have also been suggested. Since last few decades, the therapeutic potential of ozone has gained much attention through its strong capacity to induce controlled and moderated oxidative stress when administered in precise therapeutic doses. A plethora of scientific evidence showed that the activation of hypoxia inducible factor-1α (HIF-1a), nuclear factor of activated T-cells (NFAT), nuclear factor-erythroid 2-related factor 2-antioxidant response element (Nrf2-ARE), and activated protein-1 (AP-1) pathways are the main molecular mechanisms underlying the therapeutic effects of ozone therapy. Activation of these molecular pathways leads to up-regulation of endogenous antioxidant systems, activation of immune functions as well as suppression of inflammatory processes, which is important for correcting oxidative stress in diabetes and spinal pain. The present study intended to review critically the available scientific evidence concerning the beneficial properties of ozone therapy for treatment of diabetic complications and spinal pain. It finds benefit for integrating the therapy with ozone into pharmacological procedures, instead of a substitutive or additional option to therapy. 1.-Centre for Healthy Brain Ageing, School of Psychiatry, University of New South Wales, Sydney, Australia. 2.-Health Research Center, Baqiyatallah University of Medical Sciences, Tehran, Iran. 3.-Grup de Nutrició Comunitària i Estrès Oxidatiu (IUNICS) and CIBEROBN (Physiopathology of Obesity and Nutrition), Universitat de les Illes Balears, Palma de Mallorca, Spain. 4.-Department of Neurology, Baqiyatallah University of Medical Sciences, Tehran, Iran. 5.-Applied Biotechnology Research Center, Baqiyatallah University of Medical Sciences, Tehran, Iran.